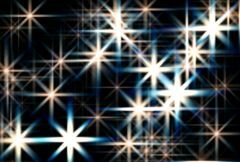 Generates a field of sparkling glint effects. Adjust the Frequency, Density, and Size parameters for different types of sparkling patterns. Use the Mask input to only generate sparkles in specified areas. Source: The current track. The clip to combine the sparkles with. Background: Optional. Composites the Source and sparkles over this clip. Mask: Optional. If provided, the sparkle colors are scaled by this input. A monochrome mask can be used to choose the areas that will generate sparkles. A color mask can be used to selectively adjust the sparkle colors in different regions. The mask is applied before the sparkles are generated so it will not clip the resulting glint rays. Frequency: Default: 32, Range: 0.01 or greater. The frequency of the sparkles. Increase to zoom out, decrease to zoom in. Density: Default: 0.65, Range: 0 to 1. Increase to add more sparkles. Scales the length of all the glint rays. Size Diag1: Default: 0.5, Range: 0 or greater. Size Diag2: Default: 0.5, Range: 0 or greater. Size Red: Default: 0.6, Range: 0 or greater. Scales the length of the red component of the rays. If the red, green, and blue sizes are equal the sparkles will be monochrome. Size Green: Default: 0.8, Range: 0 or greater. Size Blue: Default: 1, Range: 0 or greater. Scales the color of all the sparkles. Scales the brightness of all the sparkles. Translation offset of the result. Translation speed of the result. If non-zero, the result is automatically animated to shift at this rate. The result of animated Speed values may not be intuitive, so for variable speed motion it is usually best to set this to 0 and animate the Shift Start values instead. Sparkle Speed: X & Y, Default: [0.1 0], Range: any. If non-zero, the sparkles automatically twinkle on and off at this rate. Scales the brightness of the source before combining with the Sparkles. If 0, the result will contain only the sparkles image over black. If this value is positive the output Alpha channel will include some opacity from the sparkles. The maximum of the red, green, and blue sparkle brightness is scaled by this value and combined with the background Alpha at each pixel. Smooth Anim: Check-box, Default: off. Enable for more steady animation, especially at high values of Frequency. Mask Use: Popup menu, Default: RGB . RGB: The red, green, and blue channels are used.